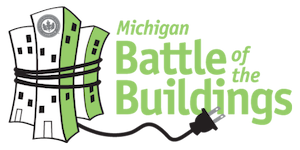 The 2018 Michigan Energy Summit celebrated the 2017 Michigan Battle of the Buildings ‘biggest losers’ and welcomed the new 2018 competitors. The full day event brought leading building owners & operators from across the state in a peer to peer learning platform. Guests learned how Michigan companies are successfully reducing their energy costs while maintaining occupant comfort & increasing productivity. Other topics included Zero Net Energy, financial incentives for energy efficiency, how to reduce carbon, and updates in an array of green building certifications. You can find the 2018 Agenda here! Each year, the Grand Rapids Business Journal publishes a special Michigan Battle of the Buildings Energy Supplement inside the business journal. It features the Biggest Losers of the competition along with their stories and how much energy was reduced over the competition year. Check out the 2018 Energy Supplement!